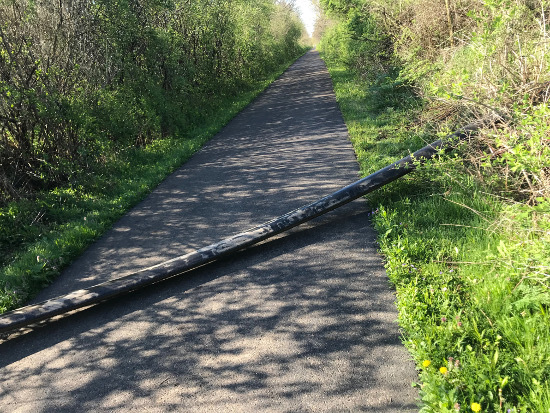 Thornville, OH - "[On the TJ Evans path network, south of Heath, OH, between Davis Dr. and Ridgely Tract Rd] ...there is a huge hose crossing the path. If someone is not paying attention they could get seriously hurt. A farmer has this hose crossing miles in the area." 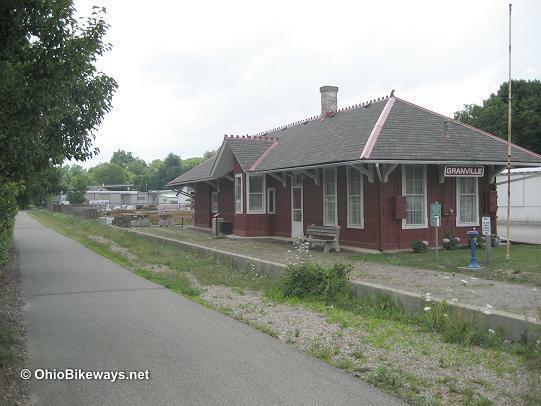 Granville, OH - "Beginning Monday July 16 - A section of the TJ Evans Bike Path in Granville will be closed from Main Street to Moots Run Rd for paving. The paving project will take 2-3 days to complete. 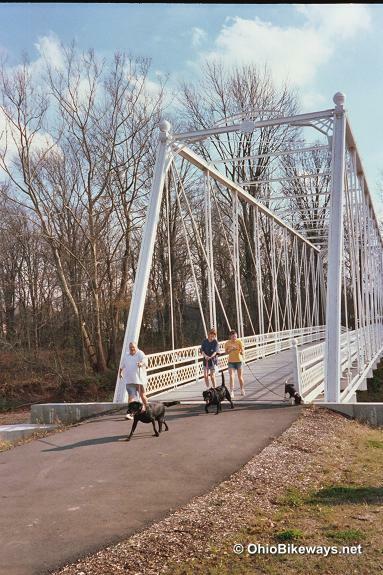 From Licking Park District, "A section of the TJ Evans Bike Path remains closed from Main St at Granville Milling up to the Granville Rotary Bridge, until further notice. The closure is due to bank erosion and unstable bank conditions. "The repair is expected to begin by mid-July and will take 7-10 days to complete once started. "For your safety, please observe all path closure signs and do not cross into closed areas." From facebook.com/Licking-Park-District, "A section of the TJ Evans Bike Path remains closed from Main St at Granville Milling up to the Granville Rotary Bridge, until further notice. The closure is due to bank erosion and unstable bank conditions. From lickingparkdistrict.com,"A section of the TJ Evans Bike Path is closed from Main St at Granville Milling up to the Granville Rotary Bridge, until further notice. The closure is due to bank erosion and unstable bank conditions." Facilities: A water fountain at the restored depot in Granville. Gas station/mini-mart across the street. Also, restrooms and water at Rotary Park along the campus connector trail. Parking: Granville, OH (See trail map for more options). Worth Noting: Facilities are scarce along the main trail, so plan on using nearby business facilities. This is a great ride on those scorching hot summer days. Most of the bikeway is lined with an abundance of foliage that gives the effect of riding through a long, green tunnel. The cover not only provides protection from the sun, but also acts as a buffer from the wind on blustery days. We rode the trail during warm, dry conditions. However, the coolness from the cover along much of the trail kept the surface from drying out from an earlier rain, despite the fact that the full sunshine had been back for a few hours! The TJ Evans Trail moves through woods, pastures and farmlands giving occasional glimpses of a creek that runs alongside and a river along the campus connector along Rt. 16. This bikeway has a history of poor surface maintenance. So keep an eye out for potholes, large cracks and other surface surprises that could ruin your ride. Riding from Johnstown to Newark the trail makes a gradual descent that goes for several miles making the trip an almost effortless ride, barring opposing winds. There are several short bridge crossings, including one over-street passage, along with an under-road tunnel. On the campus connector trail you'll encounter more over and underpasses as well as some architecturally unique bridges along the bikeway. Trail builders successfully met every challenge to bridge the gap between the Newark to Johnstown Bikeway and the nearby Newark-OSU campus trail. Some tunnels have severe angles with the trail surface which is made more difficult by some drain grates that cross the trail and are slightly below the trail surface. A bridge along the campus connector uses uneven stones for its deck material. Looks nice, but not very practical, particularly in wet or frosty conditions. The connector starts alongside Cherry Valley Road and takes on a rolling, turning nature that straightens out as you approach the Rt. 16 bridge where the bikeway climbs to meet the highway overpass. Turn left (north) and ride over the pedestrian bridge that spans Rt. 16 to ride toward campus. This trail goes as far north as Goosepond Road. Or continue riding east over to the YMCA, within 1.5 miles of the Panhandle Trail.